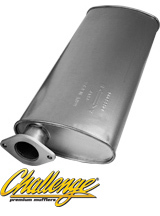 Limited Lifetime Warranty backed by AP Exhaust Products. No modifications are required for installation. Minimum back-pressure and maximum sound control to perform like OE. Fully welded necks for enhanced durability. Required support brackets welded to body. All mufflers are boxed for added shipping protection. 100% aluminized components for extended life of muffler. Our best OE replacement muffler. Designed to provide a quiet ride.